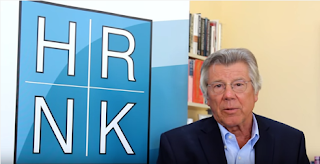 HRNK Hidden Gulag series report author David Hawk discussing North Korea’s prison camps with HRNK. On August 24, 2015, HRNK Director of Programs Rosa Park and Outreach Coordinator Raymond Ha traveled to David Hawk’s home in New Jersey to interview the author on his upcoming report for HRNK, The Hidden Gulag IV: Gender Repression and Prisoner Disappearances. 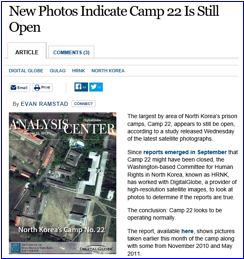 This report, along with North Korea: Imagery Analysis of Camp 15 “Yodŏk” –Closure of the “Revolutionizing Zone” by AllSource Analysis and HRNK, was launched on September 18, 2015 at the Newseum in Washington, D.C.
Interviewer: How did the first Hidden Gulag come about? David Hawk: Well, when the Committee for Human Rights in North Korea was first formed, it was known generally but vaguely that there were prison camps of some sort or another in North Korea, and they hired me to go to South Korea at a time when there were 3,000 refugees or defectors from North Korea who had gone to China and come around to South Korea via Mongolia or via Southeast Asia. Among the 3,000 refugees or defectors, there were several score who had been imprisoned while they were still in North Korea. So, I was hired to go to Seoul and interview them and prepare a report on political prison camps in North Korea. The Committee [for Human Rights in North Korea] had decided that rather than hire a Korea specialist or a Korean speaking scholar, they wanted someone with a broad background in human rights and a broader background in phenomena of repression in a variety of countries and political situations. Since I had previously worked on documenting the Khmer Rouge genocide in Cambodia and the massacres in Rwanda, I had experience with documenting worst case violations. So, they asked me if I would be interested in undertaking a study, and I was very much interested because when I was Executive Director and then on the board of Amnesty [International] and on the board of directors of Human Rights Watch Asia in the 70s and 80s, we both at Amnesty and Human Rights Watch did a lot of work on South Korea at a time when South Korean students and workers and pastors and journalists were very actively engaged in protesting the military dictatorship. While we were doing that work in the late 70s and 1980s, we were aware that it was probably much worse in North Korea than it was in South Korea in terms of human rights violations, but there was no information or the possibility to get information on North Korea in those decades. So, when they told me that there were several dozen former North Koreans who had been in various prison situations in North Korea, I thought this would be a very interesting challenge and opportunity to fill in that gap in our knowledge of repression around the world. That is, if you go back and look at the annual reports of Amnesty International or the annual reports of Human Rights Watch when that NGO was started, and you look in the annual reports for the entries on North Korea, mostly what you see is a paragraph saying, “We don’t have any information.” Yet, you’d have pages and pages on human rights violations in South Korea because we were able to get the name, information, and circumstances of pretty nearly every student, pastor, or worker who was arrested protesting the military dictatorship. So I thought this would be a unique challenge and an opportunity to fill in that gap in our knowledge of repression around the world. Interviewer: You are now on the fourth edition of The Hidden Gulag. What got you interested in the topic of North Korean political prison camps? Hawk: Well, it was known, vaguely, generally, that there were prison camps of one sort or another in North Korea. This was known primarily by the Korea scholars who had looked at the purges of the Workers’ Party, the army, and the general populace in the late 1960s and 70s. But it was a consensus, a global consensus, that these sorts of concentration camps, labor camps, political prison camps, were a phenomena associated with the totalitarian regimes of fascism and communism that were supposed to have gone from the scene at the end of WWII or following the death of Stalin. So, the idea that there were ongoing political prison camps or concentration camps or forced labor camps, as they are variously called, was something that struck the members of the committee as something that should not be existing in the 21st century, as this was part of the awful residue of the 20th century. Well, it was initially the members of the Board of the Committee for Human Rights in North Korea that selected the topic, and the reason they were interested was that it was widely thought that concentration camps, forced labor camps, and political prison camps were a phenomena that were associated with the terrible human destructions in the 20th century with European fascism or Soviet communism. It was known vaguely and generally that there were prison camps of some sort in North Korea because the Korea scholars had tried to document Kim Il-sung’s purge of the party, the army, the government, and the general populace of Korea. There was a consensus certainly in human rights and much broader circles that these kind of gross human rights violations are something that should have passed from the scene at the end of WWII, certainly by the end of the 20th century. Interviewer: How has The Hidden Gulag research methodology changed over the years? Hawk: The biggest change in research methodology was the availability of Google Earth. For the first edition of The Hidden Gulag, what we did was obtain very detailed maps of North Korea basically dating to the 1950s. 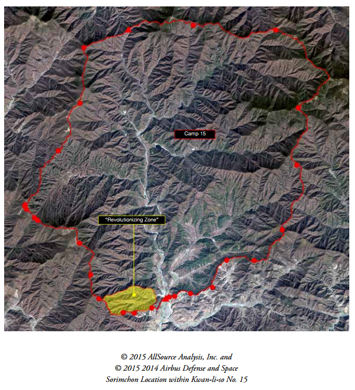 These were maps of North Korea by the U.S. Army that were by this point unclassified; they were very detailed and had degrees of latitude and longitude. These were very large maps; we’d roll them up and send them in mailers to our colleagues in Seoul, who would bring the former North Korean prisoners to their offices, and they’d look at the map, try to find the prison camp on the map, plot the coordinates, and we then would call up one of two commercial satellite photograph companies and see if they had any footage available for those coordinates. We’d then print out the footage—these were about 2 feet wide and 12 feet long— and we’d roll up those, send them to our colleagues in Seoul, who would again call the former political prisoners to their offices, and they’d then pore over for hours the satellite images of the camps. They were quite surprised because they could find their houses and their work units and other landmarks in the prison camps and identify them. We then used computers to input their identification onto the satellite photographs. It was a bit of a hit or miss process in that sometimes they picked the coordinates of the nearest town and they could recognize the road, but the prison camp itself was a little further away. So we’d get another set of coordinates and call back the satellite companies to see if they had in their storage discs any satellite imagery for the new coordinates, send the new coordinates, and mail them back over to Seoul. This was a very arduous process. It took an extra six months to do this process of getting the satellite imagery. 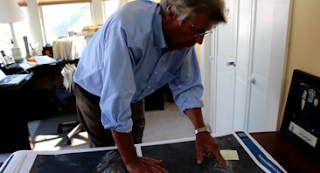 The author at home in New Jersey looking at satellite imagery provided by AllSource Analysis. 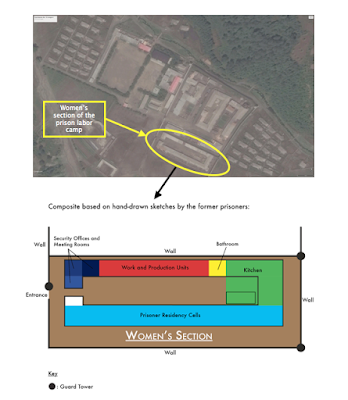 The satellite imagery was enormously important because it backed up the prisoners’ testimony about places that the regime denies exists. Of course, the regime won’t allow the ICRC [International Committee of the Red Cross] to have access to any of these facilities; nobody gets to see these places. It was very important to have the satellite images. After Google Earth came online, it became very, very easy. In fact, the Korean language version of Google Earth is very good and very precise. If you take the English language version and type in a romanized Korean name, you don’t get very much. But if you’re working off the Korean language Hangul script in Google Earth, and you type that in, it just zooms right to it. It’s now very, very easy for North Koreans to go online and look at their hometowns and places they visited, and, in this case, the prison camps where they were detained and subjected to forced labor. The reason that it is important to do periodic updates is because we’re in the odd situation of only being able to find out about human rights violations in North Korea between two and five years after the violations occur. So we’re constantly playing catch up, as it were. What has to happen in terms of arbitrary detention, political imprisonment, and forced labor is that you have to wait until after the prisoner is released or, in a couple of cases, escapes, and then spends several months or even several years inside North Korea plotting the escape to China. The refugees in China spend months or several years getting enough money, making enough connections for the journey from Northeast China through Mongolia, or down through south China and Southeast Asia to get to Seoul. It’s not until the former prisoners get to Seoul that they’re really accessible to foreign journalists, or particularly Western journalists, scholars, or human rights investigators. Because North Korea doesn’t allow North Korean citizens to make international phone calls or to have access to the Internet, there is a two to five year time lag between the time when violations occur in North Korea and when the outside world can find out about it. The prisoners have to be released, and they spend several months, possibly several years, in North Korea organizing their defection, their escape to China. Most of the North Korean refugees in China need to spend months, or even several years in China obtaining the funds and making the connections necessary for the onward journey from Northeast Asia down to south China and then through Southeast Asia or sometimes through Beijing and then Mongolia. It is not until these former victims of human rights violations reach South Korea that they’re available to Western journalists or scholars or human rights investigators. This process can take two to five years, so we’re in a constant catch-up game trying to find out recent developments. Recent developments aren’t like in the rest of the world where recent developments are something that happened yesterday or ten minutes ago that just was put on YouTube or over the Internet. There is this long delay, and up to now, there was no way around that, really. Interviewer: What is the most interesting thing you found while interviewing these three women? Hawk: Actually, I interviewed seven or eight women, but three from this particular kyo-hwa-so prison where they just built a new wing of the prison to accommodate the increasing number of women prisoners. Jongo-ri Kyo-hwa-so is written up in the first and second editions of The Hidden Gulag when it was a men’s prison. But we learned that, six years ago or so, the authorities constructed a new area of the prison to accommodate around 1,000 women prisoners. I interviewed three women prisoners from the Kyo-hwa-so Number 12. What was most interesting was the senselessness and the perniciousness of punishing these women for having gone to China in search of food because of the chronic food shortage, particularly in the northeast provinces of North Korea, or for employment so they can get the money so that their families back in North Korea can buy food in the markets. It’s actually one of the articles of the Universal Declaration of Human Rights that people have the right to leave and return to their country of origin. This right is also included in the international law forum–the International Covenant on Civil and Political Rights extends the right to leave and return to one’s country of origin. But North Korea makes that a crime. Previously, tens of thousands fled at the height of the famine in North Korea. Currently, large numbers of North Korean women who, because of the food shortage and because there is no work in North Korea, go to China and work in service industries of various kinds. They are treated as illegal immigrants once in China. The Chinese police catch them and repatriate them to North Korea where they are punished, severely in many cases, for having left their country of origin in search of food or money to buy food. Those North Koreans who are repatriated and investigated by the North Korean police after they are repatriated, if the North Korean authorities believe there was the intent to defect to South Korea, then those forcibly repatriated North Koreans are sent to the kwan-li-so political prison camps. There are tens of thousands of North Korean women who were in China not with the intent to flee to South Korea but to get food or to find a job. Because of the harshness of the punishment, it sets up a terrible situation for these North Korean women in China. There is a separate report on this: Lives for Sale by the Committee [for Human Rights in North Korea] which came out several years ago. This process is also detailed in the 2nd edition of The Hidden Gulag that discusses where the North Korean refugees in China are repatriated from and the different kinds of punishments that are meted out to them. But the fact that the punishment is so severe sets up a terrible situation where North Korean women in China are subjected to trafficking and a lot of other violations and very difficult situations. This happens because of the senseless punishment of the North Korean women who have gone to China in search of food or employment. So, the most interesting thing about the three women from Jongo-ri Kyo-hwa-so was the senselessness of their imprisonment and their severe punishment under very brutal conditions and the perniciousness of the risks that this exposes North Korean women to in China. It’s senseless and it is pernicious. They were using prison labor to make wigs and eyelashes that were probably being sold in China or shipped somewhere else. The other interesting thing about the women’s section at Jongo-ri Prison was that in addition to the normal forced labor, which is mostly agricultural production or mining or timber cutting, at Jongo-ri there was a work unit to make wigs and one to make eyelashes. The prison was getting boxes of hair that were sent from Pyongyang, but the prisoners believe that the hair was being collected in China, and the women prisoners would sort the hair into color and length, thread the hair into needles, sew the hairs into the fabric that was going to go next to the head, and then the wigs would be returned and sent somewhere else for finishing. They were using prison labor to make wigs and eyelashes that were probably being sold in China or shipped somewhere else. I hadn’t encountered that kind of forced labor for those purposes. There was another women’s prison in Kaechon where there were textile units that made clothing for sale abroad, but I hadn’t encountered the forced labor for wig making or eyelash production previously. I found the women’s testimony about the production techniques for making wigs in a terrible North Korean prison interesting to hear about. Interviewer: Why should we, as the American public, care about these political prison camps halfway around the world? Why should we keep track of ongoing changes? These are not your run-of-the-mill prisons. People are being persecuted and subjected to forced labor under extremely brutal conditions for having exercised their rights. They are being detained arbitrarily, and their detention constitutes crimes against humanity. Hawk: The severe violations that are the phenomena of repression associated with these prisons, prison camps, forced labor in North Korea are gross violations of internationally recognized human rights, and they are what are considered to be worst-case violations, which are really atrocities and are recognized in international law as atrocities, as crimes against humanity. These are not your run-of-the-mill prisons. People are being persecuted and subjected to forced labor under extremely brutal conditions for having exercised their rights. They are being detained arbitrarily, and their detention constitutes crimes against humanity. The same reason that international public opinion as a whole should care about the crimes against humanity in North Korea is for the same reason that people care about genocides in Cambodia or Rwanda, or the anarchy, the dreadful situation in eastern Congo. These are worst-case violations, they shouldn’t be occurring in the 21st century. The only recourse available is to try to mobilize international public opinion and the governments of other nation-states around the world to try to put pressure or try to persuade the North Korean authorities that it has to improve the human rights situation in North Korea. Interviewer: On that note, why should the international community be concerned about the North Korean political prison camps and the ongoing changes? Hawk: As I mentioned before, there is a two to five year delay from the time violations are committed until the outside world can find out about it. We know that there are enormous changes going on in North Korea from the bottom up, primarily with the creation of markets, which the regime in the 1990s and first decade of the 20th century tried very hard to suppress but did not succeed in suppressing. Now, the real life situation of most North Koreans is very different from what it was a decade ago because they now get their food and their clothing not through the Public Distribution System or from factories or mines that aren’t working but from markets. We know that there are changes. We also know that information from the outside world is increasingly seeping into North Korea in the form of video, radio broadcasts, and on DVDs and thumb drives, so we want to try, even though there is a time delay between when the violations are committed and we find out about it, we still want to see what these developments are, and particularly, hopefully, if there are some improvements. I have, it’s only a general sense, but I believe there are less public executions going on in North Korea than was the case in the 1990s and the early part of the 21st century. I believe that the number of public executions has gone down. It is my sense also that there are fewer North Koreans who are being imprisoned for the political offenses of their parents or their grandparents. It is a very unusual phenomena of oppression that was unique to North Korea, although it was practiced during the Chosun dynasty in the 18th and 19th centuries. We hear fewer reports of people being imprisoned and subjected to forced labor for the political offenses, real or imagined, of their grandparents. Since the North Korean authorities won’t allow human rights investigators or the Red Cross or NGOs like Amnesty or Human Rights Watch to go in and make on-site confirmations of either the claims of the government or the testimony of the refugees, we need to as best we can keep track of the most recent developments, even if the most recent developments are two to five years previous. Interviewer: You include a list of 121 missing people in your report. How do you recommend that we find these missing people? The North Korean technical term is “revolutionizing zone,” and what’s unique about this particular revolutionizing zone called Sorimchon is that one of the prisoners who was released after three years had a photographic memory. When he was first imprisoned for being forcibly repatriated from China, he was assigned to an agricultural production unit. But then he was reassigned to assist in the administration and record keeping of the Sorimchon revolutionizing section of Camp 15. As part of his work in the record keeping section, he got to see the records of prisoners, and he got to meet a lot of them in discussing their individual work assignments with them and their production experiences. This particular prisoner had a photographic memory, so when he was released and later escaped to South Korea, he, with South Korean activists, sat down and made a list of 181 former prisoners. Of those 181, some were released, a number were executed, and quite a number died of starvation and malnutrition while in the labor camp. Of the 181, there are 121 whose whereabouts are unknown. We know that they were imprisoned, and it is really unusual to have the names and biographical information, the prior occupation, the age, of these prisoners. Of the 181, the status of 121 are unknown. Some of them could have been released, some of them could have died in detention, some of them could been moved to the lifetime imprisonment total control zones within Camp 15. We don’t know the fate or the whereabouts of the 121 former North Korean prisoners. That is highly unusual that we have the names of any of them at all. In a sense, these North Korean political prisoners have doubly disappeared. They were sent to Camp 15 without any trial or judicial process or sentencing or charges. They were not imprisoned according to the DPRK Criminal Code and criminal procedure provisions. They were just abducted by the political state security police and deported to the camps. They are held in incommunicado detention. Their families or their friends or former work colleagues are provided no information about what happened to these people after they were deported to Camp 15. The technical human rights term is “enforced disappearances.” These people were grabbed by police operating on the authority of the state and simply deported or deposited in the camps, and their fates and whereabouts are unknown. That was their first forcible disappearance. Then [based on] what we saw in recent satellite imagery about actually a year ago on Google Earth, it became apparent that the prisoner residence units in the Sorimchon section of Camp 15 and the animal, it was agricultural production and animal husbandry, but the pens for the animals, the warehouses for agricultural implements, and machinery were destroyed and demolished, as were all of the prisoner housing units. The Sorimchon section of Camp 15 does not exist anymore, and so we don’t know what happened to the former prisoners from the Sorimchon section of Camp 15. But in this case we have their names and some of the personal identification about these 181, including these 121 doubly disappeared North Korean prisoners. Interviewer: How can we hold the North Korean regime responsible for the 121 missing people included in the report? Hawk: We actually want to hold them responsible and accountable for a lot more than the 121; it’s just that in this case, we have their names. It is a well established principle of contemporary international law that those who commit atrocities should be held accountable and should be asked to account for the violations of human rights that are so severe that they are considered to be atrocity crimes. That has do be done primarily through the efforts of other UN Member States. It’s at this point only other governments that can demand from North Korea that North Korea hold accountable those who are responsible. There are institutions and mechanisms for doing this that, as of December of last year, are employed. An overwhelming majority of Member States in the [UN] General Assembly passed a resolution requesting the UN Security Council to refer the North Korean human rights situation to the International Criminal Court for its investigation and its prosecution of those who are responsible. It’s the Member States of the UN that have to continue to pressure North Korea to improve its human rights situation and to cease these criminal violations and to bring those who are accountable to justice. 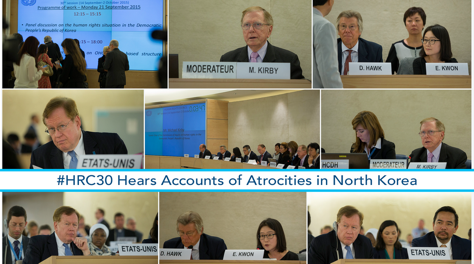 We are a long way from that happening, but it’s only since the international community took these measures in 2014 to raise the issue of accountability and obtain an account of these dreadful ongoing violations that the North Korean regime has responded at all to the concerns of the international community. Prior to this, there had been a decade of resolutions at the UN Human Rights Council. There had been a decade of reports by the Special Rapporteur. There had been a decade of resolutions at the General Assembly, and North Korea ignored all of that, all of those resolutions, all of those reports. It’s only when the international community raised the issue of accountability that the North Koreans responded. They responded in a variety of ways, none of which are the responses that are desired, such as allowing the ICRC to conduct on-site investigations, or for the regime to admit that these violations are taking place, that these prison camps exist. It’s only when the international community, other governments raised the issue of accountability that North Korea responded at all, which is why it’s important to continue to update the situation and continue to request that other governments continue to persuade the North Korean government to change its policies.